If you’re in the market for a brand-new luxury sedan that will provide you with endless thrills on the road, the 2018 Audi A6 was made for you. This sophisticated and powerful Audi will be your partner on the road, no matter where you’re heading. However, you might be considering other options out there. Finding an Audi A6 sale in the Thornhill area is easy when you choose Pfaff Audi Vaughan and our pre-owned sales facility at 115 Auto Park Circle in Woodbridge. In this article, we will be talking about some of the features included on the Audi A6. Read on for more information. When you line up the 2018 Audi A6 with the 2018 Lexus ES 350, 2018 Mercedes-Benz E 300 and the 2018 BMW 5 Series, you’ll see exactly why the Audi stands out. The 2018 Audi A6 2.0T Technik trim is outfitted with a 2.0-liter turbocharged engine that outputs 252 horsepower and 273 pound-feet of torque, allowing this refined machine to reach a top track speed of 210 km/h and accelerate from 0 to 60 in just 6.7 seconds. Plus, the 2018 Audi A6 returns up to 15 highway kp/L, meaning you can sail past the pumps while those driving a Mercedes-Benz, BMW or Lexus are forced to stop for fuel. If you opt for a higher trim, you’ll gain access to the legendary quattro all-wheel drive system that will ensure your sedan grips the road and offers precise handling around every turn. Inside the 2018 Audi A6, you’ll enjoy cabin comforts like standard heated front seats. If you choose a 2018 Mercedes-Benz E 300, Lexus ES 350 or BMW 5 Series, you’ll have to pay more for that luxurious feature. The interior is lush with modern technologies that will enhance your daily drives, from the MMI infotainment system and SiriusXM Satellite Radio to driver-assistive safety features like the optional Audi pre sense rear system and a rearview camera. The exterior styling of the A6 is signature Audi. 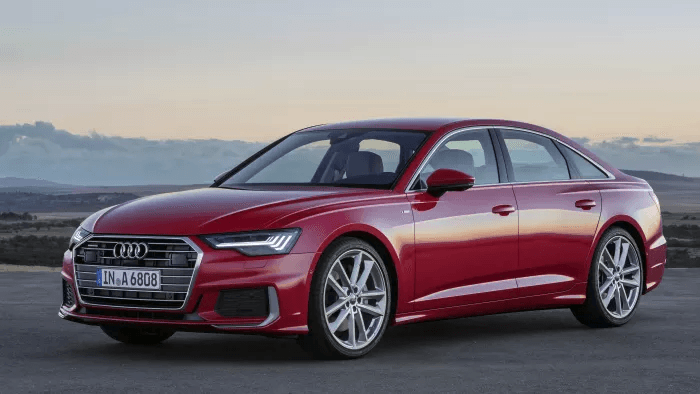 From the trapezoidal grill with its trademark interlocking-rings logo to its bright LED taillamps, the A6 features a strong family resemblance shared with the smaller A4 and larger A8 sedans. Dual exhaust openings integrated into the rear bumper and a simulated lip spoiler on the trunk add to the car’s already sporty appearance. A sunroof is standard across the range, a nice feature that some rivals offer only as an extra-cost option. An Audi A6 sale in the Thornhill area can always be found at Pfaff Audi Vaughan and our pre-owned sales facility at 115 Auto Park Circle in Woodbridge. For more information about the Audi A6, please feel free to continue browsing through our website. Click here to find our contact information, schedule a test drive, and to fill out our contact form.